THE NEW ORIGINAL WONDER WOMAN television series was regular viewing in my household. It was one of the very few representations of a comic book super hero on the screen, and while it was sometimes limited by its budgets and the crude special effects of the time, it made up for it through the appeal of its star Lynda Carter. 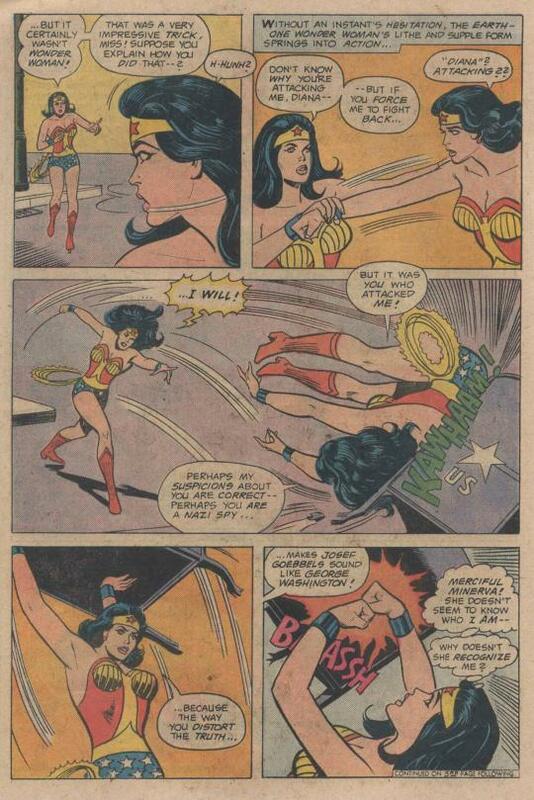 The show had been running for several months by the time this issue of WONDER WOMAN hit the stands on November 18, 1976, but it reflects the increased visibility and awareness of the Amazon Princess. Clearly somebody in the DC hierarchy felt that, in order to capitalize on the television series (which was at this point set in the past during World War II) the comic book needed to be retooled. And boy did they go out of their way to retool it. 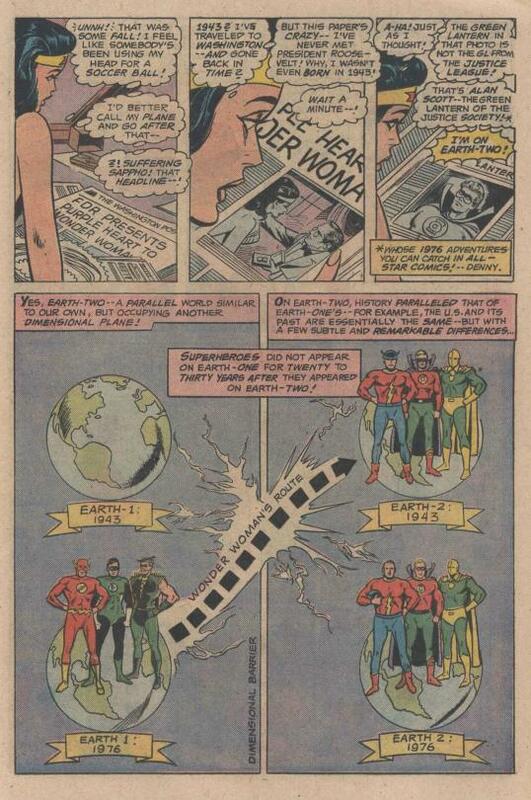 I’d imagine that any Wonder Woman TV fan who picked up this particular issue would have been confused to distraction, but writer Marty Pasko and editor Denny O’Neil tried to play fair with the continuity that they were dealing with, rather than simply setting the next story in the past. Honestly, I’m not convinced that this was the smart choice–but hey, it’s what they did. The story opens in the skies above Washington DC, where an airliner is almost collided with by a strange experimental plan e that appears out of nowhere and bears Nazi markings. 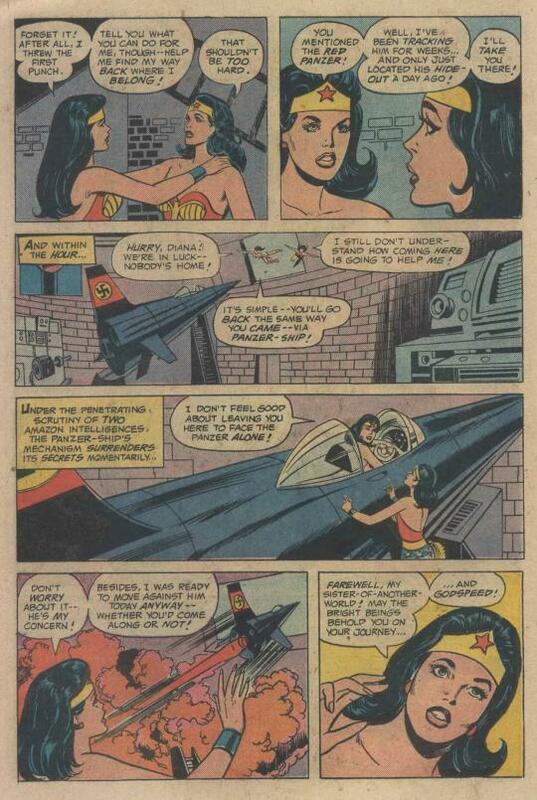 Wonder Woman is in the area, so she saves the airliner before turning her attention to the strange craft. Boarding it, she is confronted by the Red Panzer, a metal-masked baddie who seems to think he’s still involved in the WWII conflict. Before Wonder Woman can make sense of all this, a “grapple beam” pulls the craft and its two passengers back through the rift from which it first appeared. Taking advantage of the Amazon’s confusion, the Red Panzer causes his plane to barrel roll, causing Diana to plummet to the ground far below. Gathering her wits, Wonder Woman glances at a neary newspaper, which confirms both that she is now in the past, in the year 1943 to be exact–and that she’s also on Earth-2, that parallel world on which the Justice Society of America dwells, and where super heroes came into existence twenty years earlier. I’m guessing that this Earth-2 explanation is the reason why I bought this issue as I was a big fan of the Justice Society. So maybe Pasko and O’Neil’s plan wasn’t so crazy. Wonder Woman acclimates herself to the era, buying period-specific clothes. Meanwhile, the Red Panzer stews, and we learn about his origins. An underestimated genius sent to America to work on Fifth Column activities, the Panzer perfected a time-travel device that allowed him to catch a glimpse of D-Day a year away. Wanting to find out more and save his homeland, he adopted the guise of the Red Panzer and created his time-travel plane. But he overshot his mark the first time (to say nothing of journeying into a parallel universe) so he intends to attempt his voyage again. Meanwhile, Wonder Woman comes to the aid of a little girl about to be run down by a car, only to thereafter be attacked by the Wonder Woman of Earth-2. 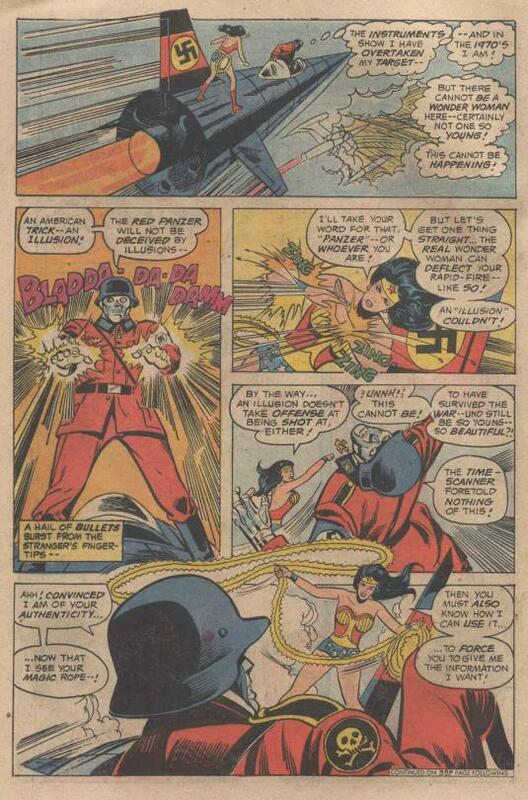 Despite her devotion to love and justice, the E2 Wonder Woman punches first, thinking her double must be an Axis spy. Because, of course. The two Wonder Women mix it up for a bit, until our Earth-1 version thinks to allow her Earth-2 doppelganger to ensnare her in the magic lasso. While thus held, she relates the events that she’s experiences–and as crazy as it all sounds to the 1943 Earth-2 Wonder Woman, she knows the lasso compels Diana to tell the truth. 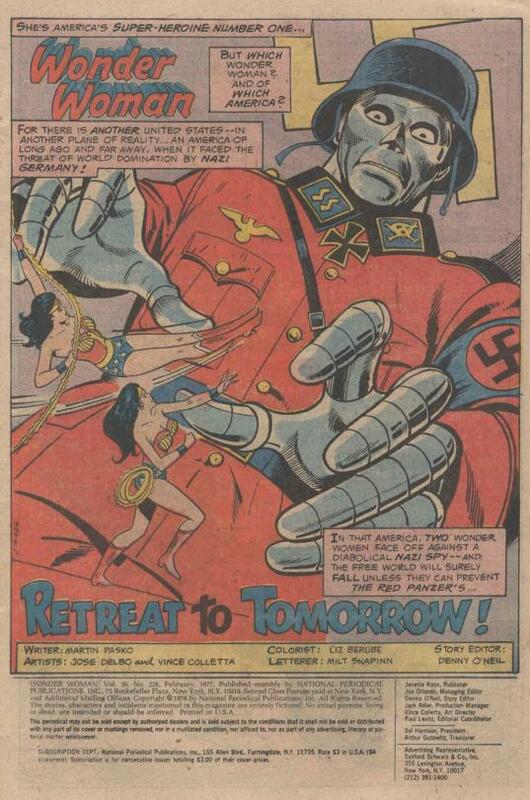 The pair set out and locate the Red Panzer’s headquarters, and the Earth-1 Wonder Woman steals his time-plane so as to return to her own world and era, leaving her counterpart to battle the Red Panzer. And battle the Panzer she does, showing what she’s made of and eventually subduing him. 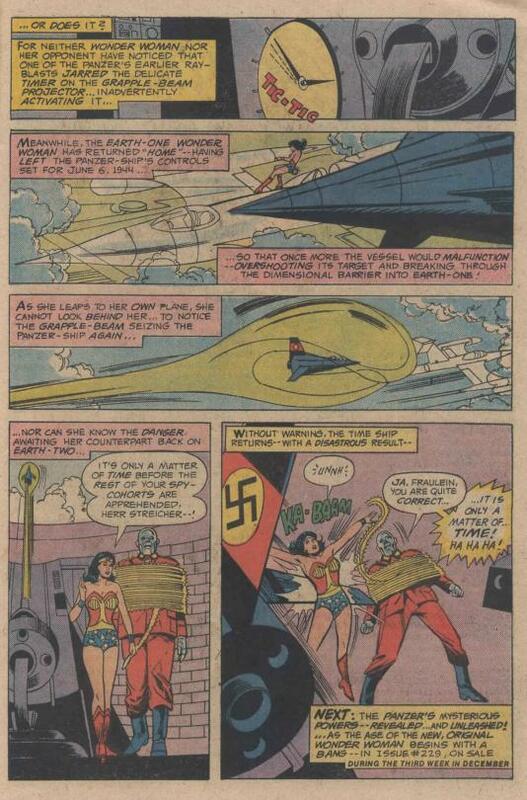 Unfortunately, the Earth-1 Wonder Woman has gotten back to her own robot plane–and now the grapple beam again pulls the time-plan back to its place in 1943–where it lands pretty much on top of Diana, knocking her out and freeing the Panzer. And that’s the cliffhanger on which we go out–and now, DC has a Wonder Woman series set in WWII like the television show. Unfortunately for them, in just under a year the TV series would shift not only networks but also its time period–making it a period piece was cost-prohibitive–and the comic would once again be forced to follow suit.